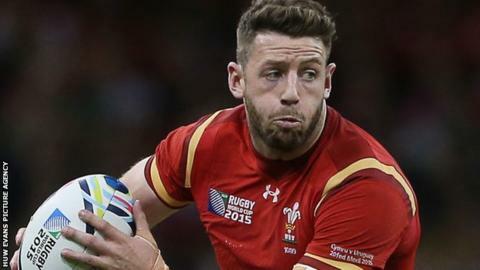 Wing Alex Cuthbert says he will cast aside concerns about his form to help Wales beat Fiji in their quest to reach the World Cup quarter-finals. Cuthbert will start Thursday's game as one of three changes from Wales' stunning 28-25 victory against England. Despite facing criticism recently, the 25-year-old is focused only on securing Wales' third straight World Cup win. "This game is nothing to do with my form. It's about this team and playing well," said Cuthbert. "I'm in the squad for a reason - the coaches and players believe in me. "I'm going to go out there like every other player and play my heart out for my country. Hopefully that will see us through to the quarters." Cuthbert came on as a substitute against England, having lost his starting place to Hallam Amos who has since been ruled out of the World Cup. British and Irish Lions player Cuthbert has been criticised after a 2014-15 season in which he was dropped for Wales' Six Nations win against France. He has scored 15 tries in 37 appearances for Wales, including one in the 2012 Grand Slam clincher against France and two as Wales thrashed England to seal the 2013 Six Nations title. The Cardiff Blues wing has struggled recently, however, touching down only once in his last nine Tests. Injuries mean that, along with George North, Cuthbert is one of only two fit specialist wings in the Wales squad. Scrum-half Lloyd Williams came on as a wing against England and provided the kick ahead for Gareth Davies' equalising try. "He's [Williams] doing well every time he comes on," said Cuthbert. "It was a hell of a kick last week and I was really pleased for him. "Hopefully this week he can come on at nine, where he wants to play!" Cuthbert will hope to end his lean spell against a Fijian side without giant wing Nemani Nadolo, who was due to mark Cuthbert but has been suspended for a dangerous tackle. "He's a quality player. It would've been nice to have a good battle against him on that flank," added Cuthbert. "You want all the quality players at the World Cup but, for us, it's going to be a bit of a benefit [Fiji] not having a goal-kicker and go-to guy. We have to take advantage of that. "They're a big physical side. They are going to be a lot of big threats all over the field, from one to 15. "We've got our game plan and we've got to stick to it for 80 minutes, and hopefully we'll come away with the win."